Posh keeper Luke McGee saves Ian Black's penalty in the draw ar Shrewsbury. Photo: Joe Dent/theposh.com. 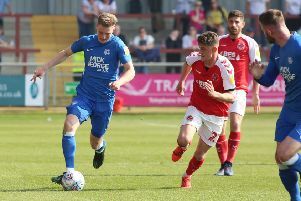 Peterborough United wil dish out a hammering soon and it might come in Saturday’s (October 1) League One clash at Southend. That’s the view of many Posh fans who are witnessing some great attacking football ruined by an inability to find a way past some very impressive goalkeepers. Walsall keeper Neil Etheridge just beats Posh midfielder Gwion Edwards to the ball. Photo: Joe Dent/theposh.com. In three successive league One games Posh have floundered against Sheffield United’s Simon Moore, Walsall’s Neil Etheridge and Shrewsbury’s Jayson Leutwiler. Posh ‘keeper Luke McGee has watched it all from afar, but he wrote his own headlines on Tuesday (September 27) when saving an Ian Black penalty in the 1-1 draw at Shrewsbury. And that high point of his Posh career was the result of top preparation. “Myself and Mark Tyler (goalkeeping coach) check the opposition penalty takers the day before each game,” McGee stated. “Shrewsbury’s main penalty taker didn’t play, but we look at anyone who has taken a penalty so I knew how he (Black) had scored and how he had missed. “Luckily I guessed the right way and made the save. “It was an important save as were down to 10 men and we went on to defend very well. “We showed what we are all about and it’s not just exciting, attacking football. “We’ve had frustrating games because we have outplayed most of our opponents without winning. “We’re just not finishing sides off, but with the talent we have in the squad that has to change. A trip to Roots Hall is a virtual home game for McGee who lives less than 30 minutes drive from the ground. “I know Southen goalkeeper Mark Oxley very well as well as he’s also a local lad. Posh manager Grant McCann has been pleased with his on-loan goalkeeper’s form. McGee is initially staying at the ABAx Stadium until January. “I’ve been very happy with Luke,” McCann stated. “He has good hands, he commands his penalty area and he is very comfortable with the ball at his feet which is important to the way we play.